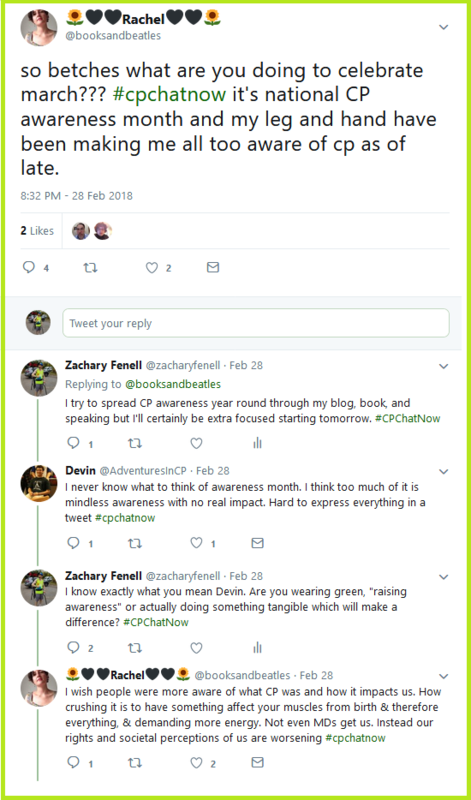 Much meaningful conversation occurred Wednesday, March 14th, 2018 during the live cerebral palsy Twitter chat #CPChatNow. I am co-host Zachary Fenell and guess what? Correct! I am in recapping mode. With the date March 14th, 3-14, the mood proved extra festive. March 14th aka Pi Day gave participants an additional reason to celebrate the Wednesday. Heather DeYoe shared she celebrated Pi Day by eating wild blueberry pie. Meanwhile the closest I came to pie involved a GIF I tweeted earlier in the day. Although the dialogue began on a lighthearted note, topics soon turned serious. Shira sought comfort related to a frustrating family situation. This led me to pose a reflective question. My question asked what you wish or wished your parents did differently. Hailey Hughes expressed a desire for her father to understand some movements happen unconsciously. For example, motions like irregular arm positioning and walking flat-footed. Elsewhere in the chatter, challenges long-time regular Hannah Pike continues facing led to a taboo subject surfacing. Hannah mentioned not seeing herself as a fighter because no other option exist. I commended her mindset, voicing an uncomfortable truth. Others might contemplate suicide as an alternative. “It (suicide) only transfers the pain to your family and friends” Hannah reasoned. We agreed, recognizing the need to discuss suicide. Increased discussion could convince someone to reach out to find help. Helping to lighten the chatter, I proposed a question designed to spark creative thinking. 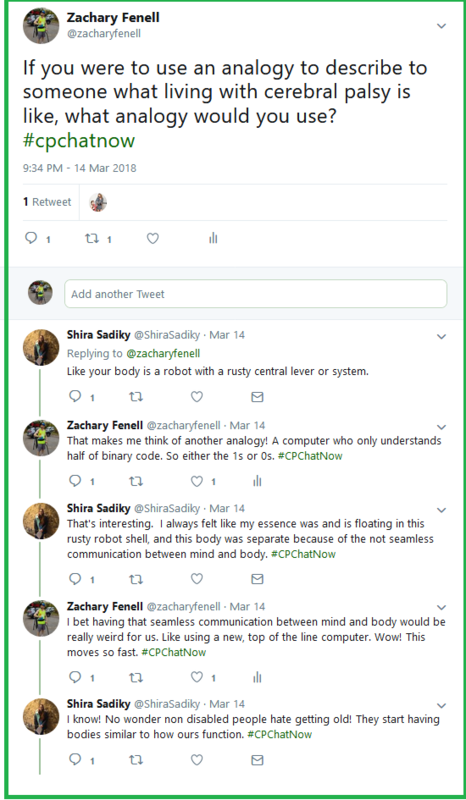 Shira and I went back and forth answering my query, “If you were to use an analogy to describe to someone what living with cerebral palsy is like, what analogy would you use?” Responding, Shira likened cerebral palsy to a robot with a rusty central system. Her response triggered me to say a computer who only replies to 0s or 1s but not both binary code elements. Do you want to add to the conversation with your own analogy? Go ahead! 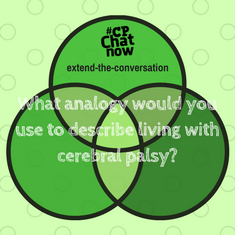 Answer for the week’s extend-the-conversation question, “What analogy would you use to describe living with cerebral palsy?” Leave your answer in the “Comments” section. Also double check your calendars. Our next focus chat approaches fast! Our very own Rachel will lead the chat, focusing on the past year in CP. Reflection analyzing the positives and negatives related to the CP community from March 2017 to March 2018. Contact Rachel if you would like to see anything particular addressed Wednesday, March 28th. Prior to contacting Rachel though, remember to answer the week’s extend-the-conversation question. “What analogy would you use to describe living with cerebral palsy?” Respond in the “Comments” section below. Then countdown the hours to our next Twitter chat. 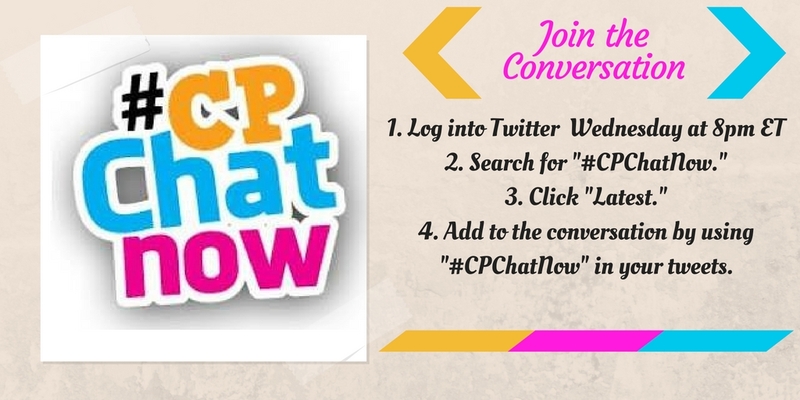 #CPChatNow happens every Wednesday at 8pm ET. 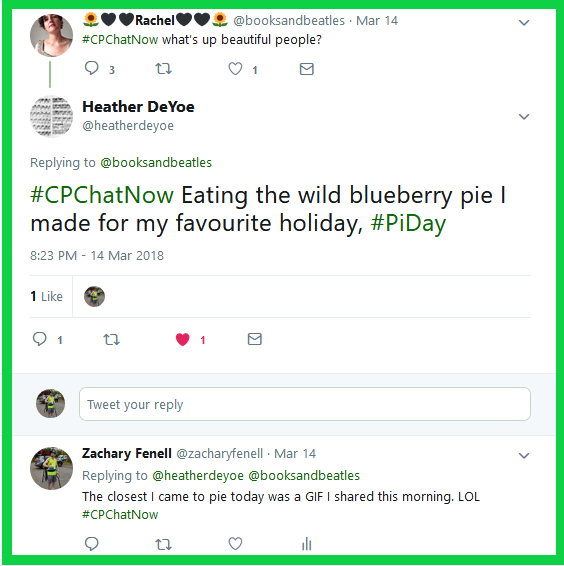 This week in #CPChatNow was a rambling week as always. This is #CPChatNow co-host, Devin Axtman, taking you along on this week’s recap. Talk then turned to dreams. 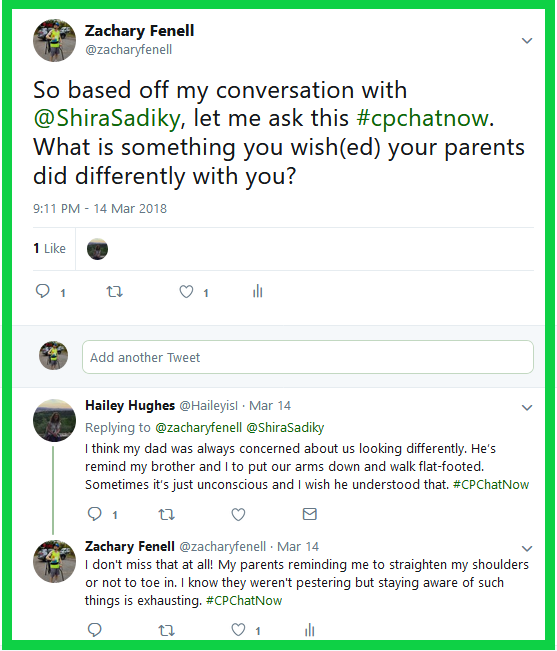 Shira and Zach discussed the appearance, or lack thereof, of CP in their dreams. Then, talk turned to pain and CP. We talked about the difference between CP related pain and normal, everyday pain. Finally, talk turned to the all-too-familiar 1-10 pain scale and how CP can cause confusion of how to rate someone’s pain. This brings us to our extend-the-conversation question: How does CP impact your perception of pain? Please share your answers in the comments and join us every Wednesday at 8 PM ET on Twitter at #CPChatNow. 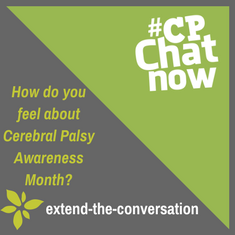 Participants in our weekly cerebral palsy Twitter chat #CPChatNow discussed many topics Wednesday, February 28th, 2018. I am co-host Zachary Fenell, taking on the challenge to recap the lively discussion. Before recapping the many subjects visited, I wish to emphasize a reminder given during the chat. 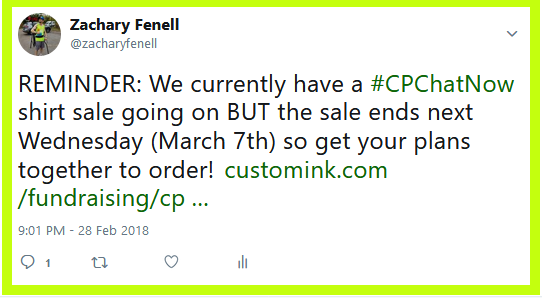 Currently we at #CPChatNow remain in shirt sale mode, with a shirt featuring a lime green #CPChatNow logo and a line underneath, also in lime green, reading “Established December 2013.” You can pick up the shirt in either navy, forest green, and/or sapphire. However, the sale ENDS Wednesday, March 7th, 2018 when the clock strikes midnight in the eastern time zone. So order today! Proceeds from the sale will go to the non-profit foundation Keep On Keeping On (KOKO). KOKO assists those with severe disabilities through helping families fund physical therapy and other medical expenses. Help us help them make a difference by either purchasing a shirt or making a monetary donation. Truly, the shirt sale concludes at a fitting time. After all, March marks Cerebral Palsy Awareness Month. 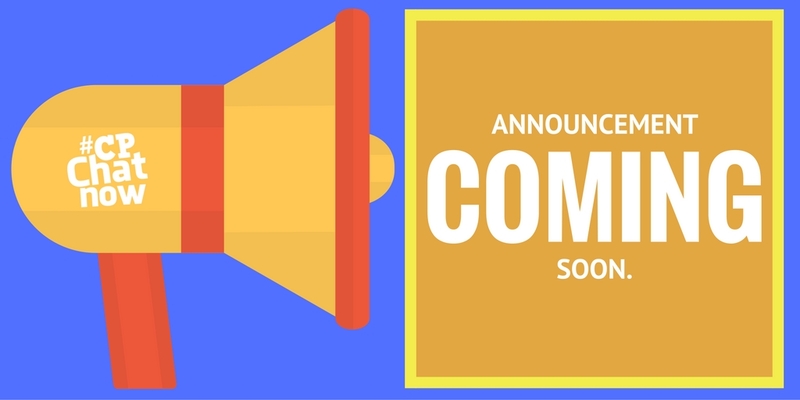 Said topic left our community buzzing Wednesday, February 28th. 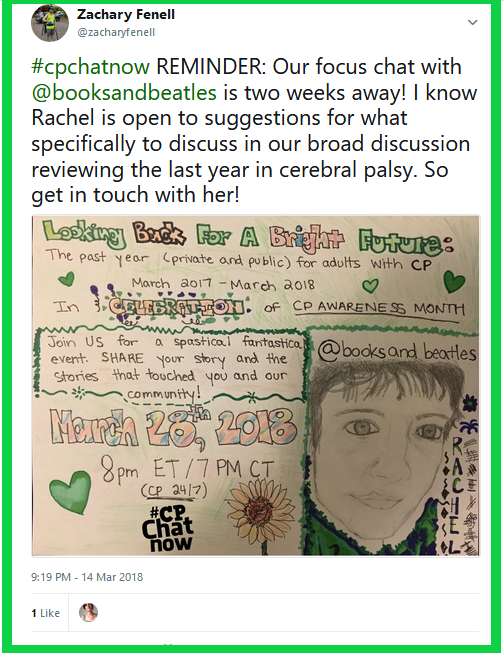 Rachel asked what people planned to do for National Cerebral Palsy Awareness Month, quipping that her leg and hand “have been making me all too aware of CP as of late.” I replied I work to raise CP awareness year round through my blog, memoir Off Balanced, and public speaking. Nonetheless I plan to become extra focused in March. Meanwhile my co-host Devin shared some skepticism. He wants to see meaningful activity oppose to”mindless awareness with no real impact.” Those comments lead us to this week’s extend-the-conversation question. “How do you feel about Cerebral Palsy Awareness Month?” Answer in the “Comments” section. 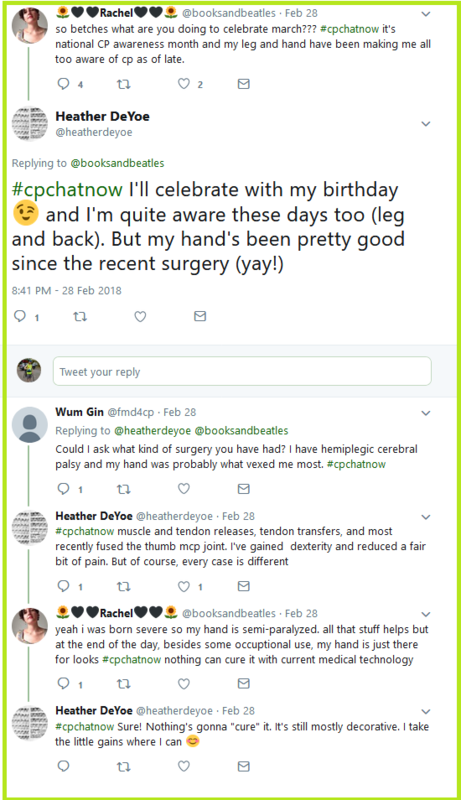 The CP Awareness Month dialogue eventually transitioned, based off Rachel’s hand and leg quip. Participant Heather DeYoe noted her birthday occurs during CP Awareness Month. She also empathized with the hand issues Rachel mentioned. Although Heather also indicated feeling relief from such issues after recent surgery. That left Wum Gin wondering the operation Heather underwent. Elsewhere I discussed with longtime regular Linds a matter Linds blogged about recently, weird dreams. Amidst the aforementioned post “My Weird Dream Lately…#1” Linds recalled a dream where she proved free from cerebral palsy. 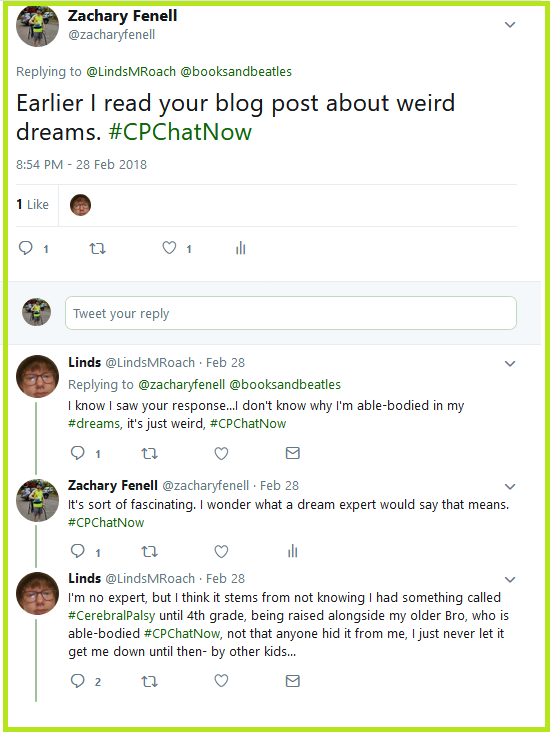 I found the fact Linds didn’t have CP in her dream fascinating and pondered what a dream expert might deem the significance. Offering her non-expert opinion, Linds suggested the fact could relate to not knowing she had something called CP until fourth grade. Her speculation caused other participants to reflect back on growing up with CP. A direction evolving into chatter centering around math class! Rachel, Devin, and I went back and forth recalling our differing experiences in math class. Rachel described her math class as “sketchy.” I touted my good performance in the subject, at least until I reached pre-calculus. Devin possessed a relatively opposite experience. Geometry presenting the only math class leaving him to struggle. Rachel added many with CP find difficulty with math. Perchance the math keeps you hesitant towards purchasing a “#CPChatNow Established December 2013” shirt, I will crunch the numbers for you. Each shirt costs $24 and then another $4.99 in shipping, bringing the total to $28.99. The sale ends Wednesday, March 7th, 2018 at midnight ET, meaning upon this recap’s initial publication you hold less than 30 hours to order. Proceeds will go directly to the non-profit foundation Keep On Keeping On. With that one final plug done, one task lingers. For you to answer the extend-the-conversation question! Again, this week’s question asks “How do you feel about Cerebral Palsy Awareness Month?” Respond in the “Comments” below.